A couple of months back I was invited by Street Smart Clothing to check out the Magic Show in Las Vegas. The Magic Show is the largest trade show for the apparel industry in the world. Apparel companies from around the globe flock to Las Vegas to show off their latest fashions. 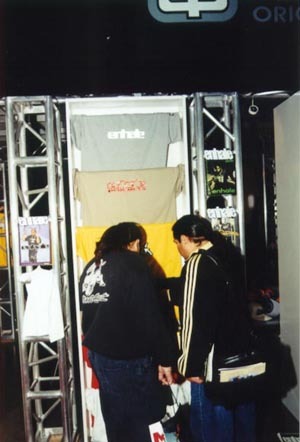 Every type of clothing apparel is displayed from business suits to urban street gear. As you can imagine all the action was at the hip-hop side of the convention. I went with the mission of finding the top Latino based fashion companies. Out of the thousands of companies that were there literally only a handful were Latino based. The main ones that made their presence felt were Aztlan Graphics from Chico, Tribal Gear from San Diego, Willie Esco from New York, and Joker Brand from Los Angeles. I was glad to see that they are some clothing designers out there that are representing us. Are we doing our job by representing them by sporting their gear?? ?